New Sullivan on Comp publication provides comprehensive analysis of recent significant changes to the California workers’ compensation law and is available as a free, downloadable e-book. 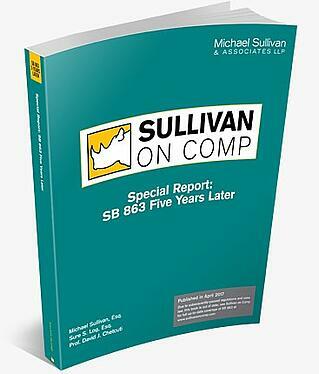 LOS ANGELES, CA (PRWEB) July 11, 2017— Sullivan on Comp, a California Workers’ Compensation legal treatise publisher, today announced the release of the new “Special Report: SB 863 Five Years Later” e-book. This comprehensive, 285-page book is available online as a free download at http://www.sullivanoncomp.com/sb-863-five-years-later. There are over 500 persuasive cases and approximately 20 binding or significant cases interpreting the provisions of SB 863. Currently there are roughly 20 different sets of regulations implementing SB 863, with others still in development. Senate Bill 863 (SB 863) was passed on August 1, 2012 and established significant changes to the California workers’ compensation system. Since this legislation passed, administrative regulations have been promulgated, case law has issued, and subsequent legislation has been advanced to clarify the reforms. Employees, employers, and their representatives need to constantly adjust to the new practices as they are adopted into law. "Sullivan on Comp" is the most comprehensive treatise available on California workers' compensation law. The material is explained thoroughly and clearly, using jargon-free language. The publication is used by attorneys, claims adjusters, employers, and anyone else that needs current, complete, and easily accessible information on this body of law. Subscribers access “Sullivan on Comp” online or receive a multi-volume print edition that is updated annually. To learn more about Sullivan on Comp, visit http://www.sullivanoncomp.com.